People who go on cruises value the quality of the food and drink above anything else, according to ABTA’s Holiday Habits report. The research found that 78 per cent of those asked said it was what they valued the most, closely followed by the chance to see multiple destinations (76 per cent) on a cruise. ABTA’s Holiday Habits report uncovers British holidaymakers’ booking behaviour in the last 12 months and their attitudes to planning and booking holidays in the next year, both in the UK and abroad. Quality of accommodation on board cruise ships was another element people valued when considering cruises with more than half those asked saying the variety of itineraries on offer was especially important. • One in 12 of those asked had taken a cruise holiday in the last year, with one in eight considering going on one in the next 12 months. • More young people are considering going on a cruise in the next 12 months compared to last year. • Among people who have been on a cruise, those aged 65 plus are most likely to want to go on another one (29 per cent). Victoria Bacon, director of brand and business development at travel trade association ABTA, said: “The cruise industry is adapting to the changing demographics and demands of holidaymakers. • P&O Cruises has a number of Food Heroes who they say help to ‘raise the bar’ with fantastic food and wine. World-famous chef Marco Pierre White is the mastermind behind the Ocean Grill restaurant on Arcadia and the patron of The Cookery Club on Britannia. • Earlier this year it was announced that the noted Spanish chef Ramón Freixa will contribute main dishes and tapas in a new culinary partnership with MSC Cruises. • Fred. 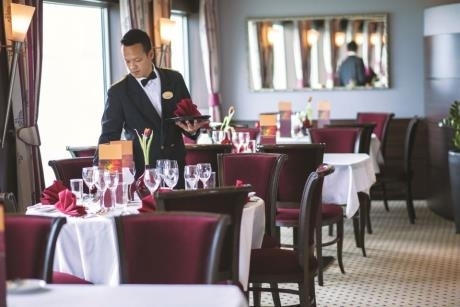 Olsen Cruise Lines has a number of speciality dining experiences on board its ships including The Black Watch Room (Grill restaurant) which can seat up to 46 guests and offers an extra special dining experience. It also offers a five-course à la carte dinner served in the Panorama Restaurant of its river cruise ship Brabant. • Known as ‘king of the kitchen’, executive chef George Streeter who is ever present on board Saga Sapphire is well renowned for the quality of his food. Main image: Dining on board Fred. Olsen Cruise Line’s Brabant ship.